Maison Charles was originally established in 1908 by Ernest Charles at the former Ullmann bronze works, the company was located at 103 Rue de Turenne in Paris. Charles specialised in the reproduction of antique lighting and gained a significant reputation in the field of bronze casting. In 1923 The company was taken over by Emile Albert Charles. By 1959 Emile is joined by his two sons – Jean, a graduate of l’école Boulle and Jacques, an interior design graduate of the Arts Appliqués (Applied arts) in Paris. In 1960 Charles aquired Maison Pierre Fargette – a long established Parisien lighting design house – The business moved to 16 Rue du Parc Royal, in le Marais. During this period the Charles family including Jean’s wife Christyane Charles created many signature pieces in a fresh new style including well-known lamps such as the Ananas (pineapple), Epi de Maïs (corncob), Pomme de Pin (pine cone), Lotus, Medici Vase etc. In 1965 Jacques Charles creates the “Collection Inox” (Stainless Steel). The Orgue (Organ pipe) lamps enjoy great success and become a visual reference point for the period. In 1971 Christyane Charles become artistic director at Charles. In 1981 a Chrystiane Charles design, the Orchidée lamp, wins the LAMPE D’OR design award at the Salon International Du Luminaire De Paris. 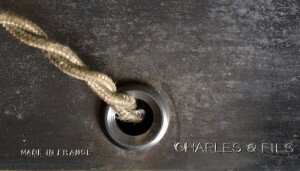 In 1984 “Charles Bronze d’Art” joins the Comité Colbert, an association which brings together the most prestigious art houses in France, endorsing the company’s reputation for quality. Also in 1984 a Laurent Charles design, the Colisée lamp, wins the Lampe D’or design award at the Salon International Du Luminaire De Paris. in 1992 Jean Charles is awarded a Special Mention at the Salon International Du Luminaire De Paris in the “Lampe d’or de la Creation” category for the modernity of his “Stockholm” lamp designed 40 years earlier. Chrystiane Charles is also honoured for her work as a whole. In 2001 Maison Charles was acquired by Michael Wagner who takes on the role of company president. Wagner relocated the Charles workshops to the former Christofle workshops in Saint-Denis (Paris). In the 21st century Charles continues to supply bespoke orders of its eclectic range of 20thc design classics. From 2006 under the artistic direction of Philippe Parent, new models were produced by a new circle of designers including Jean Boggio, Guillaume Vincent, Paco Rabanne, Luc Gensollen, Jean-Manuel Freitas and Joelle Fevre. In 2014 Emmanuel Bossuet became the new artistic director of Charles New projects include a re-issue of many of Felix Agostini’s designs working with Agostini’s daughter Dominique. 3details recently acquired a quantity of original Maison Charles drawings and photographs From the early 1900’s through to the 1950’s The collection will be exhibited later in 2016.